Our fully functional API allows you to perform a full structural analysis similar to using SkyCiv Structural 3D with the added benefit of running our solver around your own program/code. The API expects a POST request in JSON format and will return the results for the structure in JSON format as outlined in the documentation below.After a structure has finished solving, you can view the deflection results of the structure in 3D. The documentation for SkyCiv's v2 API solver can be found here. Descriptions, tables, and code examples have been provided to ensure that you have an intuitive experience using the API. Can't find what you're looking for? Email us at [email protected] and we will happily attend to your queries. Note that API v2 is not compatible with API v1. Data structures have changed to accomodate the newer (and faster) solver which now handles plate analysis too. 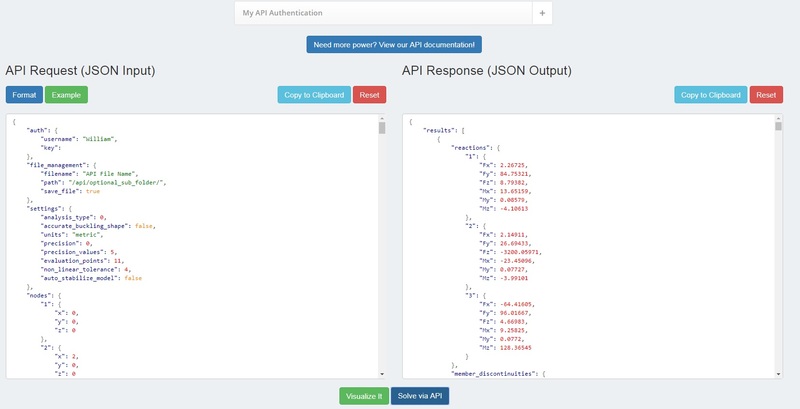 View our interactive API sandbox which allows you to plug in an example and run the API to receive your results.